According to the experts, swimming is one of the best exercises out there for all-round fitness and wellbeing. It’s low-impact and relaxing, while still working on your aerobic fitness and counting as a form of resistance training. It's ideal for many returning to exercise in January. If you’re ready to take your water-based workout to the next level, a swimming fitness tracker is where it’s at. 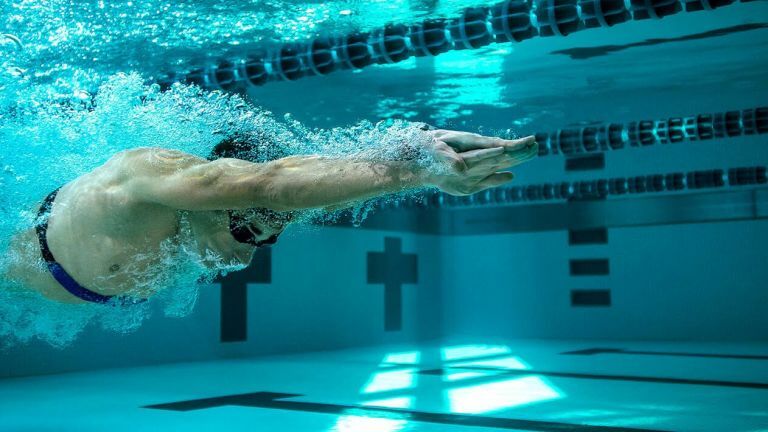 The best fitness tracker for swimming should be a few things: waterproof (obviously), comfortable (although surely anything beats those locker key wristbands) and packed with a decent range of measurables that allow you to keep an eye on your progress. Give or take a few metres and metrics, that’s exactly what each choice on our list of the best swim trackers does. Really, the big choice is between a dedicated fitness tracker – only one of our picks, the Moov Now tracker, is specifically designed just for swimming, and does a great job of it as you’ll find out below – and a smartwatch with fitness tracking built in. It probably goes without saying that if you’re a keen athlete or triathlete who depends on a range of activities to keep things interesting, you might want to go for more of an all-rounder, a multi-sport tracker like our number one choice the TomTom Spark 3, or an Iron Man-ready tracker such as the built-like-a-tank Polar V800. On the other hand, if you want your sleep and activity tracking, plus all your messages and anything else you can think of, in one handy gadget, go for a smartwatch like the Apple Watch Series 3. When it comes right down to the nitty gritty, it makes sense to take a close look at each of our top picks and see whether the metrics they provide will be enough to keep you on track – or, conversely, whether they’d be overkill for casual swimming. We’ve summed up what we think the best bits and pitfalls are of each one to help you make your choice. If you’re a fitness fanatic, preferring to try your hand at multiple workouts rather than restricting the action to the pool, you might want to give the TomTom Spark 3 a whirl. It’s our best fitness tracker for swimming not just because of its swim-specific metrics, but precisely because it’s great for other sports too. Swim duration, number of movements, distance and movements per minute are all logged to give you an overview of each workout, and the SWOLF or Swim Golf score that monitors your efficiency in the pool is a nice touch. Don’t be tempted just to stick with the big-name brands on your quest for the best fitness tracker, because the inexpensive Moov is a great dedicated swim tracker, never mind the fact that it comes in at under £100. Stroke count, swim distance, time and number of laps are all picked up on, which is pretty much par for the course when it comes to the trackers on the market, but the stroke recognition is a real added bonus, as is the Moov Now’s big selling point: its analysis of the data you put into it, which allows it to give you advice on how to improve your swim workout. It might not be the best looking, but for the price and the impressive functionality it gives, it’s our best for those looking to get properly into swimming. Despite its early-Casio-esque looks and considerable chunkiness, the Polar V800 is surprisingly feature-heavy, and comes out as our best fitness tracker for triathletes. If you do more than just swim, you’ll appreciate the running and cycling tracker modes, but if you do spend most of your time submerged, the separate pool and open water swimming modes are sure to appeal, as will the newish firmware update that, once paired with a device running iOS, give the tracker the ability to receive updates, more like a smartwatch. Sure, it’s a bit hefty, but reviewers report that it’s solid-feeling and above all comfortable, which is just what you want during a marathon swimming session. The Apple Watch Series 3 does all the basics – distance, lengths and time – but rivals the Moov Now with its stroke recognition, if not its tailored progress reports and advice. Of course, it’s also over seven times more expensive, so while it’s obviously the best all-round gadget, it’s a bit of an investment. That said, it has a surprising number of features that make it a great swim tracker, such as GPS for open-water swims and even a self-locking mechanism that, once unlocked, expels any water from the speaker. Pretty amazing stuff, but obviously best considered if you’re in the market for a swim tracker that’s way more than just a swim tracker. The Misfit Shine swim tracker is one of those fitness bands whose every element is designed to suit life in the water. Water resistant to 50 metres and build from aircraft-grade aluminium, it’s a durable little thing, with a sleek look that’s unusually elegant when compared with the chunkier fitness watches on our list. You can even take things to yet more minimal levels if you like – the slim disc doesn’t have to be worn on the band, but can be clipped to a swimsuit or trunks, where it’ll happily track distance and calories burned on the dedicated swim mode. If you’re looking for a great fitness tracker under £200, the Samsung Gear Fit2 Pro might be right up your lane. It’s a vast improvement on its predecessor the Gear Fit2, not least because it’s now waterproof to around 40m, bringing it into the list of viable contenders for best swimming fitness tracker. It’s engineered to work with the Speedo app in Speedo Mode, which allows you to set the length of the pool and your goal for that session, and get specs like your pace and duration in return. It also looks great for everyday wear, both in and out of the pool, with its slick integrated screen. The Fitbit Flex might not be the brand’s flagship band, but as their first tracker for swimming it’s still going strong, and deservedly so. It packs in the same swim tracking metrics as the three-times-the-price Ionic, namely pace, distance, laps and time spent in the water. Some found that stop-start swims could throw off the accuracy of the results reported back, so while it’s arguably best kept for quieter evenings at the pool, anything that pushes us to keep up the pace is a win in our book. And, with access to Fitbit’s superior all-round activity tracking, it’s still among the best in terms of software.